The VRT-EBU LiveIP Studio Project has won the IBC2016 Innovation Award for Content Creation during a prestigious gala event at IBC2016 in Amsterdam. The LiveIP Studio, the world’s first fully functioning multi-vendor live production system based entirely IP and IT technology, was awarded top honors in a category that included BT Sport for its Augmented Reality for the UEFA Champions League project, and ESPN for the Pylon-Cam project. 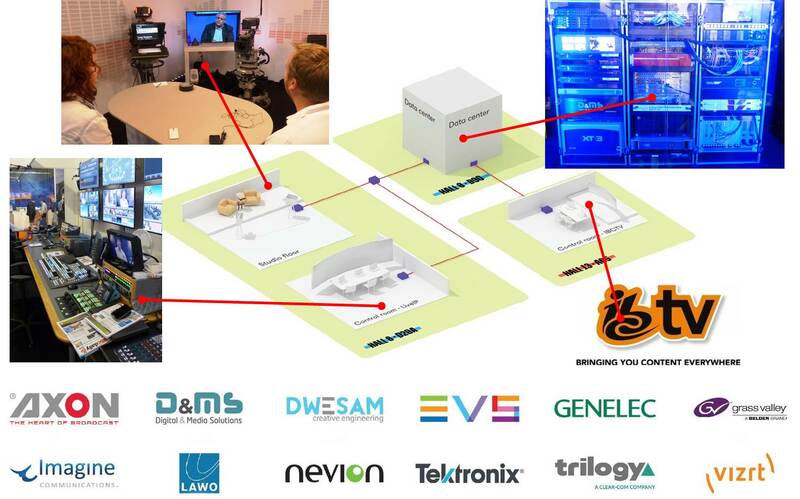 Driven by the VRT Sandbox incubator program and the EBU, and powered by a long list of partners including Axon, Digital & Media Solutions (D&MS), Dwesam, EVS, Genelec, Grass Valley, Imagine Communications, Lawo, Nevion, Tektronix, Trilogy and Vizrt, the LiveIP project has developed a fully functional IP production studio. Using existing open standards SMPTE 2022-6, AES67/RAVENNA, PTP and OpenFlow, this venture demonstrates a high level of interoperability and leverages the unique benefits of IP to create efficiencies, such as remote production and automation. “Audiences expect more today in their viewing experiences, and one way broadcasters are delivering is by providing 4K content,” noted Neerav Shah, senior vice president of strategic marketing, Grass Valley. “4K provides a number of important advantages for broadcasters, including the ability to capture better quality for real-time delivery today or on-demand delivery at any time in the future. It is also a key differentiator as content becomes the main focus for our customers.” Information about the implementations at Dome Productions, Game Creek Video, Lyon Video and Mobile TV Group is listed. TV Skyline GmbH has built a reputation as one of the most innovative service providers for television and broadcasting in the region. Its HD OB Van fleet is equipped with the latest, highest quality broadcast technology to support productions in sport, entertainment and events. Now, with the addition of 21 new cameras from Grass Valley, TV Skyline’s newest truck—OB8—is ready to provide uncompromised 4K/UHD or HD production as needed. The company evaluated camera options from a number of different suppliers and determined that the LDX Series was the best fit for the features and functionality it needed. Gearhouse Broadcast, a leading supplier of specialist broadcast solutions, has announced that it is building a 4K supertruck that will be available for use throughout the USA. Based in Los Angeles, CA, the new mobile unit has been commissioned to add to Gearhouse’s mobile business in the region, which has experienced continued growth in recent years. It is being designed specifically for the US broadcast market, giving customers further benefits from Gearhouse’s experience in providing the technical equipment, facilities and services to capture the world’s most watched content. The new 4K truck is being built by Gearhouse Broadcast’s UK-based systems integration team and specialist coachbuilder A Smith Great Bentley and will be available for 4K and HD productions in early 2017. At IBC2016, Evertz, Ross Video and Solid State Logic announced their participation in the launch of YouTube Space London. YouTube Space London opened their 20,000 sq. ft state-of-the-art facility in August 2016 for collaboration, learning, and production for their YouTube creator community in London and Europe. The IP-based production facility uses 10GbE to move uncompressed video, audio, and metadata (using SMPTE RDD 37) between its three studios and two control rooms. The IP infrastructure provides YouTube Space London with complete flexibility and agility where any source is available anywhere. SiA, the production company of the Proximus group, selected Lawo’s solution to deliver its IP Remote Production infrastructure. To realize the project, SiA, Proximus, Lawo, NEP Belgium and Videohouse established a joint ‘dream team’. With Proximus delivering the best network, Lawo the IP Remote technology, SIA its TV facilities and NEP Belgium & Videohouse the expertise on the field. This is the first time the technology is deployed on such a scale for a football competition in Belgium. Massimo D’Amario, Managing Director of Skynet iMotion Activities: “We are incredibly proud of the fantastic achievement of the joint team. Two months from start to live is just amazing. " A new assignment to be proud of: RTL and TV producer Blue Circle (a division of FremantleMedia Netherlands) have chosen United as their facilities partner to organise the technical support for the new RTL Boulevard. United came up with this remote direction solution by working together with its customers to increase the efficiency of the workflow. As a result, the production of RTL Late Night and the direction of RTL Boulevard have been integrated at the new studio on Leidseplein since 29 August. United has introduced new equipment for this purpose, such as the high-quality Sony HDC‑2500 cameras. New direction facilities have furthermore been realised next to RTL Boulevard’s studio on Leidseplein in Amsterdam. Its not often you get one of the best seats in the stadium at an English Premier League match but when Polecam rigs were used to provide both live and Ultra Slo Mo 'inside the goal action’, Tom Paterson of Forager Films and Stuart Nicholls of Emagine Productions stepped up with their rigs to offer their services with the help of Camera Corps. Tom Paterson explained “Using the remarkable Antelope PICO minicams on our Polecam rigs we were able to give the OB director shots and angles which until recently were rarely seen on football coverage. Terrific action from behind the goal-keeper with the cameras unobtrusively poking through the net gave a very effective wide shot which was perfect for covering goal-mouth action." For the past two years, the Korean Baseball Organization (KBO) has been relying on third-party broadcast feeds to review close plays and make important decisions that can affect the outcome of each game. With little control or consistency in this process, KBO was looking for a way to improve and standardize its video replay process across the entire organization. After evaluating its options, KBO selected nine K2 Dyno Universe Replay Systems with K2 Summit 3G media servers from Grass Valley. KBO worked closely with SAMA GVC, Grass Valley’s channel partner in Korea, for purchase, training and service. Ericsson (NASDAQ: ERIC) has signed BT Sport as its first client for PIERO Augmented Reality, a cutting-edge software system that enhances sports programming and creates more immersive viewing experiences. PIERO Augmented Reality, which launched in April, enables broadcasters to overlay 3D graphics in real-time during live studio productions and sports games. Sports analysis graphics can be produced instantly either by a system operator or by a presenter using a tablet device. The graphics are then projected onto the studio floor in 3D allowing broadcasters to illustrate the analysis sequence without cutting away from the studio environment. The market-leading technology integrates easily with major studio tracking systems and popular sports data service providers. Multi award winning Italian singer / songwriter and music producer Laura Pausini started her 2016 world touring campaign in support of her new ‘Simili’ studio album with a brand new lighting design created by Alain Corthout and Ignace D’Haese from Belgian based creative visual design practice, Arf & Yes. The tour kicked off with 5 large stadium dates – all completely sold out - in Italy for which the set and video was designed by Igor Ronchese from Tekset based in Paderno Dugnano. It now continues in the U.S. where Pausini has a massive following especially amongst the Hispanic population, and then Latin America where she is also hugely popular. At the 27th Lo Nuestro Awards in 2015 she stated that although being Italian, “half of my heart beats Latino”. The well-attended ceremony saw almost 500 professionals come together to celebrate the achievements of lighting and video designers working on shows across the UK. Pio Nahum, CEO of Headline Sponsor Clay Paky comments: "The Knight of Illumination Awards has evolved to become one of the most significant events in the lighting and video design world and provides the ideal platform for awarding the hard work and stunning creative talent of professionals operating in it. As we look toward the KOI 10th anniversary in 2017, we think back to the event Clay Paky started almost a decade ago and are immensely proud of how it has developed year on year thanks to the sponsorship and support of almost all the major businesses in the entertainment lighting and video technology industry." "Bluebell has put considerable effort into building a solution for single-cable transport of 4K signals. It's something customers have asked for and something that will be more and more imperative as UHDTV comes to the fore," said Paul McCann, managing director, Bluebell Opticom. "With the BN390, broadcasters can avoid using quad HD links, which are cumbersome and time-consuming to rig and install, in favour of sending all signals on a single coax or fibre cable. There are few if any other products like the BN390 on the market today." The BN390 reduces the cable count for a 4K signal from four cables to one for easier rigging and installation. The module supports a wide range of multiplexing and conversion modes and serves as a toolkit for many cameras and interface requirements. Italy-based RAI and Berlin-based manufacturer Stage Tec have signed a framework agreement for 18 AURUS Platinum mixing consoles and NEXUS for a total of 3.5 million Euros for 3 years. Stage Tec and PR.IN.CO., the Italian distributor, announced the deal at IBC in Amsterdam. The contract is the result of an international tender which Stage Tec succeeded in winning. Over the next three years, RAI will receive 8 large AURUS 48 fader consoles and 10 consoles with 40 faders. Each console is complemented with a NEXUS STAR router. The mixing consoles' audio DSP power is standardised at RAI and includes the new Platinum DSP. RAI and Stage Tec Berlin – that’s a successful cooperation which has lasted more than 20 years and is still going strong. "Riedel's SmartPanel with the MediorNet Control App saves us a tremendous amount of time and effort in adapting equipment in our trucks to address varying production requirements," said Alessandro Reitano, Vice President, Sports Production at Sky Germany. "Facilitating fast, easy routing and control of all signals across our SNG and OB tender trucks, the SmartPanel gives us a new degree of flexibility that translates to greater efficiency in our overall operations. Simultaneous intercom functionality allows us to save space by using the same panel for both routing and communications. Two of the newly-announced live production servers have already been installed in MEDIAPRO’s OB39 outside broadcast facility – the truck which produced MEDIAPRO’s first UHD output of an El Clasico game in the 2015 season. With these servers installed OB39 will be utilised for the weekly production and transmission of La Liga football matches in 4K. Another five XT4K servers will be integrated into OB33, a new truck that’s currently being built by MEDIAPRO that will debut in November and be able to produce in multicast UHD using up to 16 cameras. The three remaining live production servers will be installed into OB40, a HD production facility that’s currently being upgraded to create UHD content. Japan’s NHK public broadcaster was showcasing its latest 8K OLED screen at IBC, developed in conjunction with LG Display and Astra Design. Measuring a staggering 130” across, the current plastic ultra-thin model can drop from the ceiling in the style of a cinema screen, and comprises 4 separate 65” screens stitched together. The screen is just 1mm ‘thin’. Engineers from NHK’s Science & Technology Research Labs, speaking at IBC, said the R&D team were working towards having the technology in place for retail by 2020, and the Tokyo Olympic Games. Other concepts under consideration would see screens able to be used in place of wallpaper, and while a separate box of electronics would need to be placed close to the screen it would not necessarily need to be fixed beneath the screen.